Occasionally, minor errors are noticed on old notes that have already been in the collector pool for a while. I have come across two such notes recently, with minor print errors on them. Below is a war code 10 Shilling note with a small portion of the face printing on the reverse (top left edge), caused by the previous note being folded whilst being printed. This left some ink residue on the bed of the printing press which was then picked up by the next note (this one pictured) resulting in some of the face printing on the reverse of the note, illustrated in the zoom image. Enlargement showing a portion of the face printing on the reverse of the note. Now that is a nice find! 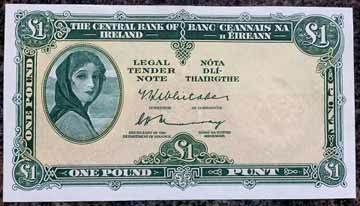 Here is an interesting serial number error on a Lady Lavery £10 note. Errors of this type appear to be rare. Here's an interesting error £1 note that turned up recently in an auction. It is curious in that part of the left serial number is missing (otherwise printed normally), and the entire date and right hand serial number is missing. Possibly it was folded when being numbered. The pic is not good enough to see if there is a fold on the note. That is a intriguing error and difficult to explain. 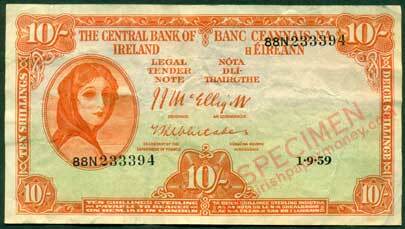 It would be interesting to see if any other notes with serial number close to this one turn up. The date should be 17.5.74 and the number appears to be 40K 88358? Notes of this type have been seen without serial numbers but these are probably not errors but unissued remainders. Example attached. Mac wrote: Here's an interesting error £1 note that turned up recently in an auction. I think I might have worked this one out. The error would occur if the banknote on top of this one had a fold on it, so it would end up with part of its left serial number missing, and this note would pick up the missing part of the number. If both sheets were ejected together, then this one would be left as it appears now with part of a number only. That makes perfect sense. I will keep a look out for notes of the same prefix close in serial number to this one ! Here is another £10 note missmatched serial number error, quite close to the one above. 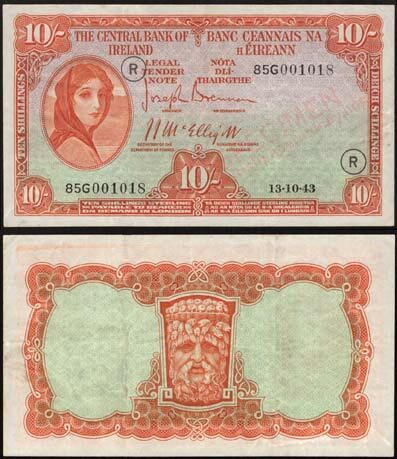 There are other examples known from this run of notes also. A 10 Shilling note error with date and serial numbers out of place. Wow, I have not seen such an extreme example of misplacement on a Lady Lavery note before ! There are some nice errors here. 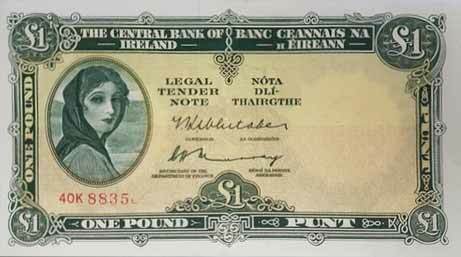 I figure Lavery errors are scarcer than later Series, as there were far fewer notes being printed then. I like the war code error note, it has probably been in many collections before being noticed as an error. £10 Lady Lavery twin notes found in my late father in laws effects. The notes had been mentioned by him when he was alive but never seen. I can understand some printing errors where the paper has been folded or colours missed out on a run of notes, but how do two notes end up with the exact same details? That's an interesting pair of notes! I am not certain how this error might occur. One possibility is that this type of error could occur if the cylinders on the numbering machine got stuck for some reason. Both cylinders getting stuck would be unusual - missmatched serial numbers are a relatively common error, where one cylinder gets stuck for a time. A pair of £1 notes with the same number have also been seen within the last couple of years. I do note the ink on the bottom one is far lighter... could it be that it was to be discarded or something? I wonder could the error have something to do with stopping and starting of the printing process. Once printing resumed, the last serial number of the previous run was printed again? Maybe the numbering got stuck and there were 100 of them with the same number? Here is a slipped serial number digit error on a Lady Lavery £20 note.Recently available on ebay. That's an interesting example. How much did it sell for? Link to 24.3.76 on eBay please?